The Scott E-Spark 720 Full Suspension ebike delivers an amazing experience to the rider, and is now available for test rides here at OnBike. Scott have long been recognised as one of the world’s leading outdoor giants. They have an enviable reputation for quality and design, and this certainly shows with the Scott E-Spark 720 Full Suspension. It’s 27.5″ Schwalbe Rocket Ron tyres sit on Syncros X37 650b rims and together with the fully adjustable Rock Shox suspension facilitate a superb ride, comfortable over all terrains. With Rock Shox XC 30 TK’s on the front suspension and an X-Fusion E1 RL on the rear, you are in command of how much give and take you prefer. Introduce Bosch’s Performance Line high torque motor with 3 sensors for speed (rear wheel), cadence and torque integrated in the drive, a 400Wh battery, and you have a veritable beast underneath you, waiting to be unleashed! The Shimano Shadow Plus gearing ensures sweet shifting, and a weight of only 19.6kg means the Scott E-Spark 720 Full Suspension handles like a dream. With such power (and fun) available, you’ll need effective braking. The Shimano BR-M447 Disc brakes squeezing 180mm SM-RT54 CL Rotors ensure that when you need to slow down, the bike responds immediately without hesitation. As if that wasn’t enough, the Scott E-Spark 720 Full Suspension utilises Bosch’s acclaimed Intuvia display for clear and easy to read information on speed, range, trip and much more. The battery’s fast recharge time of only 3.5 hours ensures that you don’t need to worry about overnight charging. 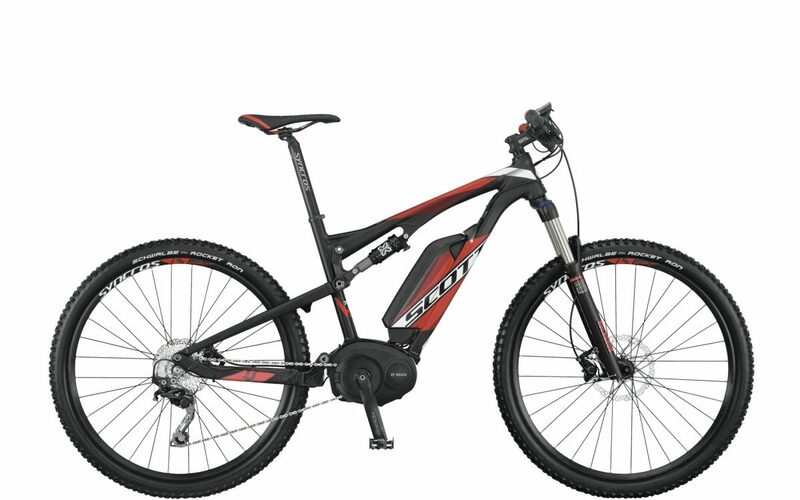 If you’re in the market for an off-road electric bike, then the Scott E-Spark 720 Full Suspension electric bike at only £2,999.00 presents itself as one of the best value electric bikes on the market. This entry was posted in News and tagged Electric Bike, Front Suspension, Full Suspension, Rock Shox, Scott Electric Bikes.